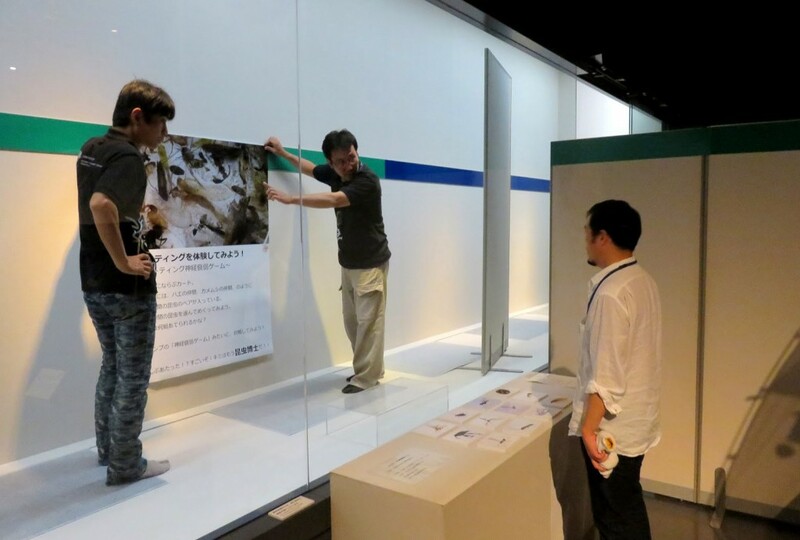 This summer at the Okinawan Prefectural Museum, OKEON (Okinawa Environmental Observation Network) Chura-mori Project will be hosting a stall to showcase their activity. 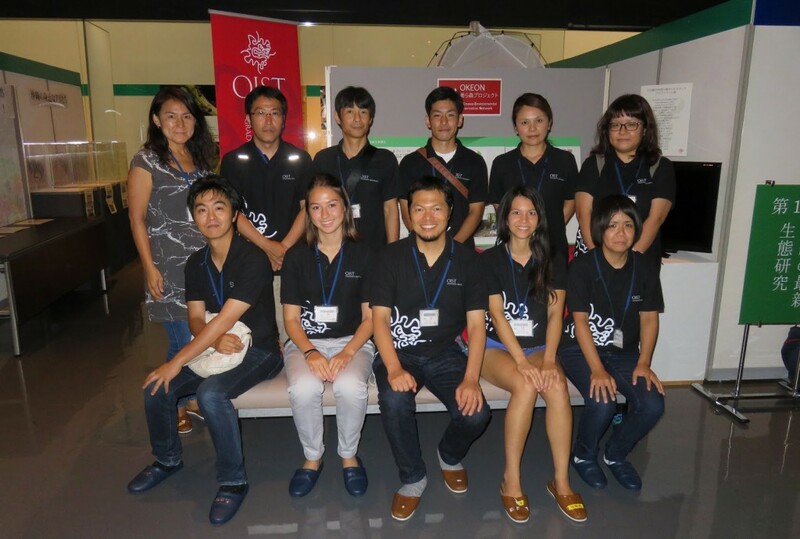 OKEON is a network which monitors the terrestrial environment of Okinawa, involving researchers at OIST, the local community, and collaborators at universities, museums and schools. The exhibition will allow people to gain an interactive understanding of the work that OKEON does. Visitors will be able to watch a video explaining what the project is, see a real-life example of a SLAM trap used to collect insects, and practice their fieldwork skills in a label writing workshop and insect sorting game. Preparation for the exhibition has been underway for the past couple of months. Everyone involved has been working hard to ensure that the exhibition visitors not only have an educational experience and learn something new about how biology and conservation fieldwork is carried out, but also have a fun and interactive time. 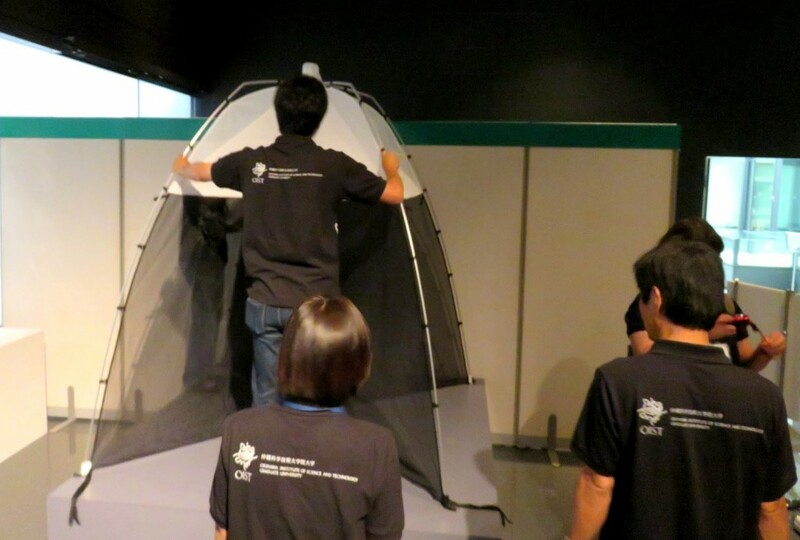 On July 11th, the OKEON team went to the museum to set up the exhibition booth. 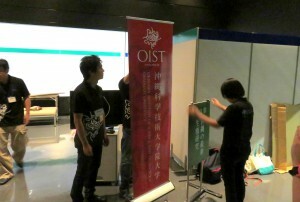 We faced a number of challenges setting up the exhibition. One of these was that despite having seen the available space previously, having made the materials in reality there was concern that it would not all fit into the space. The equipment available to showcase the materials were also not exactly as imagined. This meant that improvisation and flexibility was necessary, both talents which the OKEON team have in abundance. Working with motivated people from a diversity of backgrounds made for a strong team, and by the time we left, everything looked good to go. The curator, Mr. Yamazaki, was helpful and provided guidance wherever he could. For example, when we found that the lighting was too dim to see some of the posters, he offered to provide additional lighting to ensure that everything would be visible on the day. However, it was still necessary to reprint some of the materials. While sometimes, the tiny alterations and attention to detail seemed unnecessary, this exhibition is incredibly important to the OKEON project, as well as OIST. Unlike other media publications such as a documentary, or a newspaper article, this exhibition will be displayed for a month and a half, and therefore has a greater longevity as well as the potential to reach many more people in surrounding communities. For this reason it was imperative to aim for perfection, in the hopes that more people will take an interest in learning more about not just OKEON and the importance of environmental education, but also OIST and the research it produces, and its’ capability to collaborate successfully not only on a global scale but also on a local scale. With so much work having gone into the booth, the exhibition is bound to be a great success. Be sure to stop by and check it out!